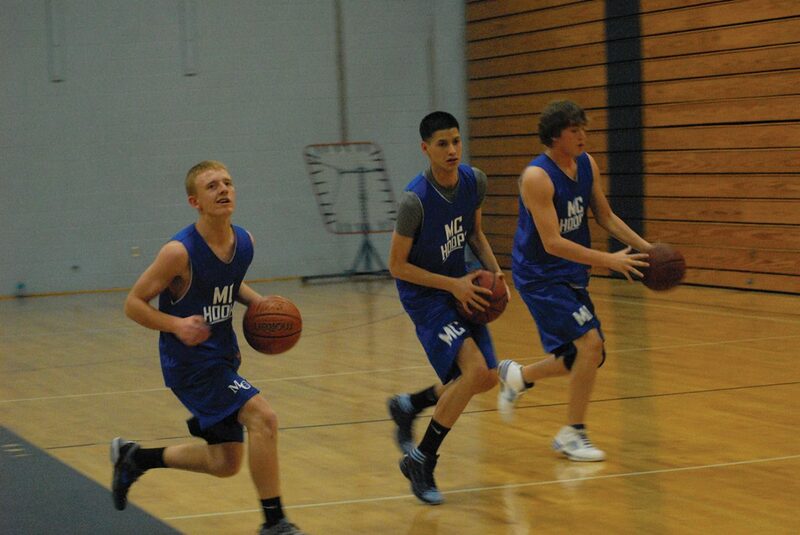 From left: Tyler Davis, Miguel Molina and Denton Taylor work through a ball-handling drill at Moffat County High School boys basketball practice. The three sophomores played with the varsity team last year and will be integral parts of the 2012-13 team. Key team stat: Moffat County will rely on several sophomores and a couple freshman to give them valuable minutes this season. The boys basketball team at Moffat County has high expectations of taking the next step as a program. The team, which won just two games two seasons ago, begins its second year in the Eric Hamilton era this December. Hamilton took over as coach last season and the Bulldogs showed a marked improvement, going 6-15 but also playing more competitively in the majority of their games. After a successful summer league that saw the Bulldogs play with and beat 5A teams from Grand Junction and Utah, Hamilton and his players are looking to make another leap, this time into the postseason. It won’t be easy. Moffat County lost four seniors and a great deal of size to graduation. But this year’s young team also boasts varsity experience, with many juniors and sophomores returning from playing varsity last year. Craig Daily Press: What’s the attitude, the outlook for you guys as the season gets close? Taft Cleverly: Everyone’s super-excited. I think everyone thinks we’re going to be pretty good and we’re going to be able to do a lot of things. CDP: You guys have a pretty young team, do you see that as being an issue? TC: I think we’re all pretty young, but I think our team chemistry is better than it was last year and we work together better than before. CDP: Two years ago this team won two games, last year you guys won six. What do you need to do to keep that improvement going? Tyler Hildebrandt: We need to just keep working hard every day, and keeping getting better, day by day. CDP: Tyler, how have you been working with (sophomore) Denton Taylor and (freshman) Javen Gumber, the other big men who figure to be important for this team? TH: We just work hard. They help me and I help them, we just work hard in practice and that’s how we get better. CDP: Over the summer, this team played well and looked like it wasn’t worried about past results. What are your goals? TC: We want to go to the playoffs for sure. We think we’re going to be the toughest and the team that’s working hardest during the games. We’re not going to back down from anybody. We’ll play at a million miles an hour. CDP: Coach, last year was your first year and the team improved to six wins. What needs to happen to keep that going? Eric Hamilton: Well, I talked to the guys the other day about how we need to build off what our seniors did for us last year. They showed us what work ethic was like. We talked about building off the momentum we had from a good finish last year. This year we have more confidence, experience on the varsity level. We had a great summer together, had some huge wins. Now we’re just building on that momentum. CDP: You lost a couple seniors and have a young team this year, but there is still some experience on this team. EH: Oh yeah, we’ve got kids that have had varsity time. I think our summer was huge for getting us ahead of where we were last year. Playing games, running some offense. You can tell from looking at the kids that they feel like they can beat big kids and big schools. We know this is going to be a super-tough league, but these guys are up to the challenge this year. CDP: What’s the difference between 4A and 3A? EH: 4A was very tough and very physical. I don’t think this year we’ll have to play against teams with as much size and strength as we did last year. I know we’ll play against solid teams, but I think we have a chance to be one of the more physical teams in the league. CDP: It looks like people should expect to see you running all game long. EH: We’ve got a lot of things we’re going to try, but this is a fast team. Lot of quickness, lot of speed. We also have good size. We’re going to go with what works for us and we hope to be an exciting team to watch.